Bible Contradictions #38: Does god work on the sabbath? When people say that Jesus got rid of the old laws or changed them, what they are saying is that Jesus contradicted his father (or himself). That’s what we have here. In the Old Testament god rested on the sabbath, and, indeed, anyone caught working on the sabbath was executed. That’s how seriously primitive people took this rule. But when Jesus comes around and gets caught working on the sabbath, he’s like, “chill out, bro. Even my dad works on the sabbath,” thus contradicting Genesis. What’s interesting about this contradiction is that this is precisely the reason why Christians work on the sabbath today. In other words, they live by this contradiction (except the Jehovah’s Witnesses and a few other small cultish sects). It’s incredibly easy to break one of the ten commandments when Jesus says it’s ok.
(Note: I borrowed the comic in the image above from Jared MacPhee. His website can be found here). 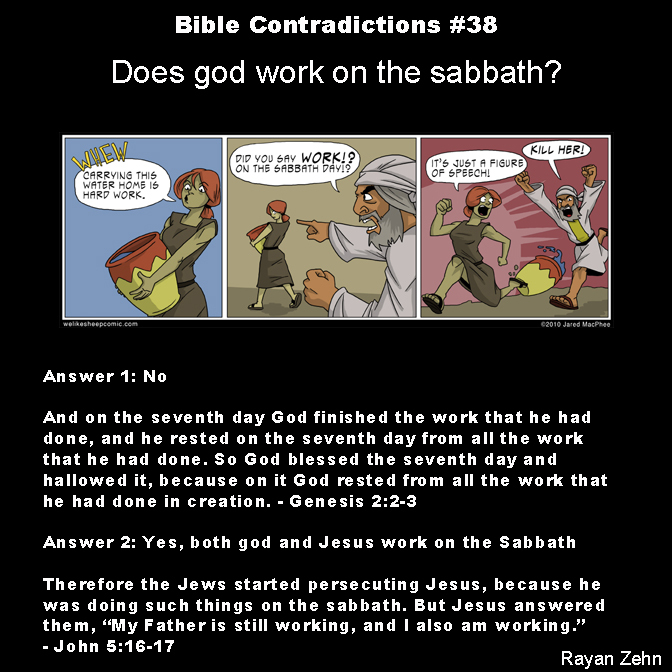 6 Responses to Bible Contradictions #38: Does god work on the sabbath? If God rested on the 7th day, it’s because he was providing an example to the new creation he had in mind, the human being. This post is yet an example of a contradiction that just isn’t there. The sabbath was made because men wanted a day off. Shame that you refuse to see this, but we know your mind has been silenced for years. Ha! The Sabbath is a Jewish tradition that goes back 1000’s of years. Judaism and Christianity are the only religions that were revealed by God. And like the ancient Greeks, the ancient Hebrews discovered the necessity of leisure time in fulfilling his human nature (telos). Which means that to understand God basics only requires common sense, something atheists are required to abandon. Regarding the sabbath: I already know. God law regarding man conforms to his human nature. Since the Greek, Ronan, Egyptian and the Babylonian are as human as you are…. …well no. The atheist has given up his humanity. Since the Greeks, Ronans, Egyptians and Babylonians are human it is no wonder that they would reason their way to the Sabbath.